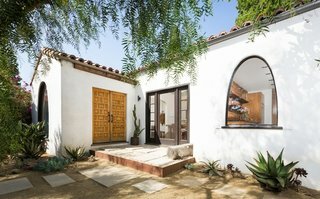 Using repurposed rustic lumber, vintage steel windows & wood doors, this alteration to an existing 1930's Spanish Revival house in the Mar Vista area of Los Angeles added private outdoor living spaces with fire pit & raised decks. Hsu McCullough uploaded Boise Residence through Add A Home. Kitchen with clerestory windows above left shelves and "eye-lid" window view to front yard landscape garden.